Do not be scared of the gizzards. It’s the English word that makes them sound so unappealing. Gi-zzards. Li-zzards. Such a harsh word for something so deep and rich in flavour. It was actually the first piece of meat that I’ve given my 6 months old son and he was delighted to ‘gnaw’ on it with his teething-toothless mouth. If you still are (scared) , try this dish with just the hearts. What can be more appealing than eating someone’s heart? Especially when it is smothered in ruby, tangy pomegranate sauce and sprinkled with hazelnut shards. It’s one to be made for an adventurous lover, no doubt…or for an anaemic friend. Otherwise save some un-sauced and give it to an unexpecting suffering baby. They would all appreciate it. Heat the oil in a frying pan until very hot. Add the hearts and gizzards and let them caramelise on each side, meaning it’s important not to stir them too often. When a lovely golden crust forms, take them out of the pan. Add a little bit more oil and the onions to the pan and cook over a medium-low heat until the onions soften and start to turn golden. Add the garlic, nuts and the spices and cook for another 5 minutes. 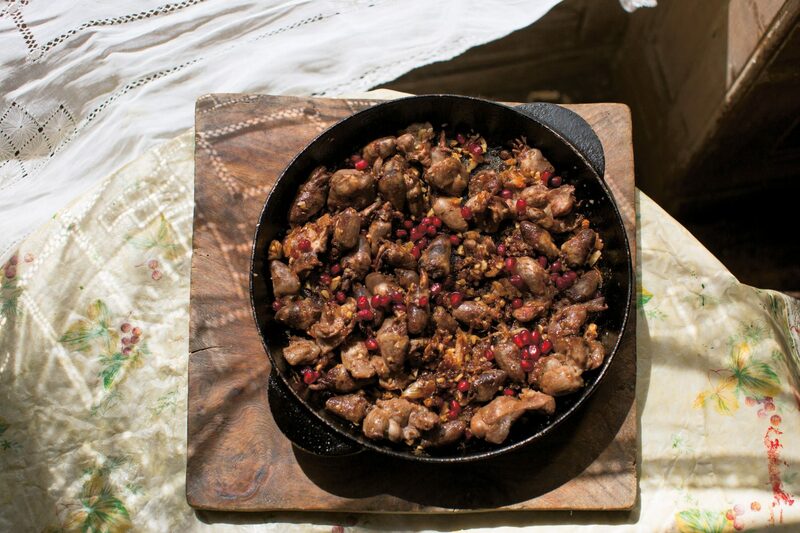 Now add the meat and the pomegranate molasses, season well with salt and pepper, cover with a lid and cook over a low heat for 20-30 minutes or until the meat is as soft as you like it. (I don’t mind it being a tiny bit chewy, so I only cook it for 15 minutes). Stir through the pomegranates and serve with some rice or some bread. If you have leftovers this is delicious used as a qutab filling (p X).